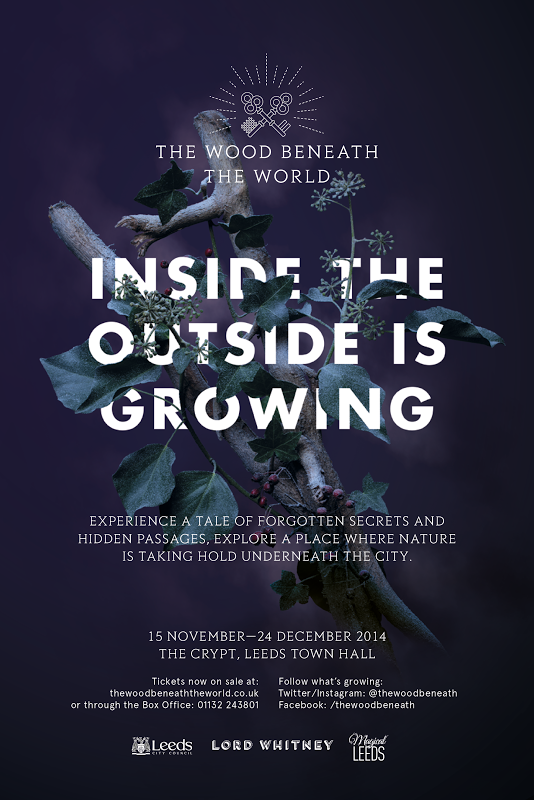 Excited to be heading out to see the Wood Beneath the World on Friday evening – I hadn’t heard of this event until recently but it sounds very interesting! Its roots and trees have now burst through the floors and walls, and the wood has taken over. The installation will include evening experiences for adults, daytime workshop sessions for school groups and a unique Father Christmas experience on weekends, where visitors are treated to a journey through the woods and storytelling sessions led by the man himself. The Leeds City Council project has been created by design studio, Lord Whitney. The design­ duo and their production team have built the set in the Town Hall Crypt, and an ambitious and an all-encompassing use of lighting, sound and performance combine to create a truly mesmerising experience for visitors of all ages. POINT OF INTEREST: During this time the Town Hall’s old Victorian cells will also play host to The Wood Beneath the World’s pop­up bar, where visitors can mull over the experience. There will be a selection of mulled wine, cider, craft beers and soft drinks on offer in the cosy bar, which will be open 5­11pm on weekdays and 11am­11pm on weekends. Check out the preview/trailer on youtube below!